I Skate, Therefore I Am: Maloof Money Cup New York skate park to include replica of Brooklyn Banks! 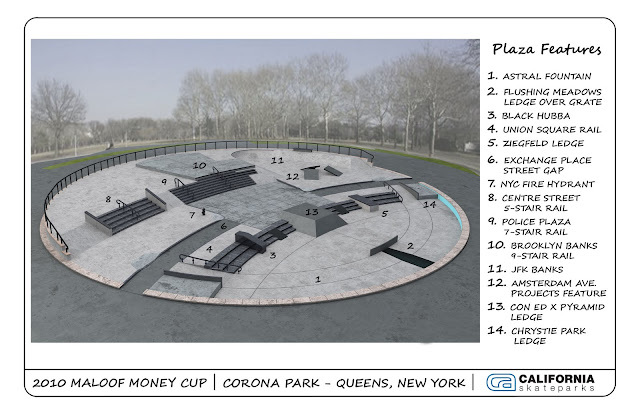 Maloof Money Cup New York skate park to include replica of Brooklyn Banks! Replicas of some of New York's most famous skate spots, including the Brooklyn Banks nine-stair rail, are included in the design of the street course for the Maloof Money Cup New York in June. The competition will be held June 5-6 at the permanent skate park, which will be built on top of the former Astral Fountain in Flushing Meadows Corona Park. First place will be worth $100,000. The Maloof Money Cup New York is an offshoot of the Maloof Money Cup, which will be held for the third straight year in Southern California. The New York Maloof Money Cup, sponsored by Vans, is hosted by Joe and Gavin Maloof, the brothers who own the NBA's Sacramento Kings. The 16,000-square-foot, $500,000 Volcom street park will be donated to the city through the NYC Parks & Recreation Department's Adopt-a-Park program. It will also include replicas of the Union Square rail, Police Plaza seven-stair rail, Ziegfeld ledge, Chrystie Park ledge, Exchange Place street gap, JFK Banks, Con Ed Banks, Pyramid ledges and Flushing Meadows Park ledge-over-the-grate. The design of the course was led by pro skaters Chris Cole and Geoff Rowley, top New York skateboarder Steve Rodriguez and Joe Ciaglia, president of California Skateparks. 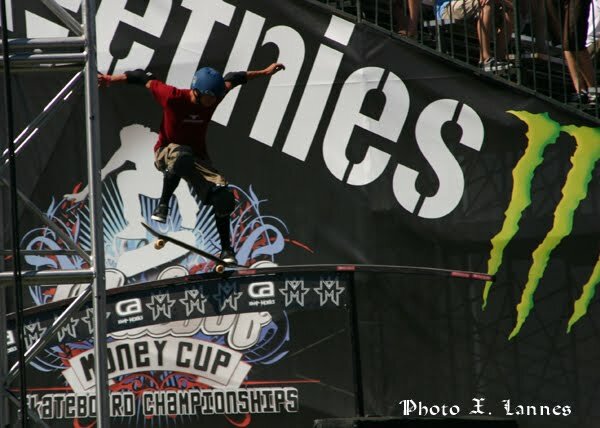 Cole won the street competition and $100,000 at last summer's Maloof Money Cup. "Inspired by some of the best skate spots in the world's greatest city, the Maloof Money Cup New York street course has replicated, and improved on, spots from each of the five boroughs, including the Brooklyn Banks nine-stair and the Banks at JFK," Rodriguez said. "Even the now-off-limits ledge over the grate beneath the Globe-Unisphere is being reproduced as best as possible to make sure that the legacy of skateboarding at Flushing Meadows Park will continue on. MMC competitors will be the first to christen these obstacles that will help define the next generation of skaters to come out of Queens and NYC." Maloof Money Cup New York features street competition only. The third Maloof Money Cup, featuring street and vert competition, will be held Aug. 4-8 at the Orange County Fairgrounds in Costa Mesa, Calif.